Jane works as a Food and Beverage Assistant. We spoke to Jane about her experience with Wildes Education. She does a variety of roles within the hotel which include serving food to guests, working on functions and events and running the bar. 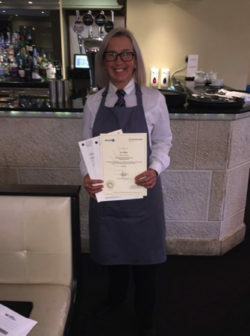 Jane has recently completed her apprenticeship in Level 2 Hospitality Services which also included functional skills in English and Maths at Level 2. Jane had some reservations at first when she started the qualification as she thought apprenticeships “were for young kids” and she hadn’t been in a learning environment since school. She has gone from strength to strength throughout the course was able to complete the tasks with assistance from the assessor. She was very good at the different assessment methods that were asked of her which included underpinning knowledge questions, observations and principles exams which all had to be achieved to complete the full framework. When Jane had completed tasks successfully she was very happy with herself and her confidence has grown throughout the training. Throughout the qualification Jane has won employer of the month and we believe that she is capable of achieving anything that is put to her. Jane is now looking to move up to complete her L3 qualification as part of her ongoing training. 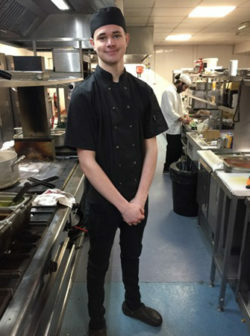 James is currently studying his Commis Chef L2 qualification with Wildes Education as he has always wanted to pursue a thriving career in Catering. Over the last 9 months since starting the apprenticeship the shy, quiet lad has disappeared. He has embraced his new position & is thriving in his role. His family feel he has become much more positive, that he gets up full of beans and has come out of his shell. James rides his bicycle to work every day, and he has gained a large circle of friends through work. In July 2018 James was put forward to the Derbyshire Times apprentice of the year by his employer to which he claimed runner up spot. He attended the ceremony with his Head Chef and Assessor to collect his well-deserved award. James plays a vital role within the kitchen and creating new menus along the more experienced Chefs to help develop is skills and confidence as a Chef. Once James has finished his L2 qualification he can’t wait to start his chapter of learning.